A first room preceded the current building, the city having built in 1792 a space until then dedicated to the game of palm to turn it into a theater. In the face of popular success, it soon proved too small. The architect Fragneau was then commissioned to rebuild it: he endowed the new building with a neoclassical facade all brick, crowned with a large triangular pediment. The capacity of the new hall, opened in 1849, was 528 spectators spread over four levels. Access was then through the rue de la Comedie, inconvenient because narrow. This situation will last until 1931. 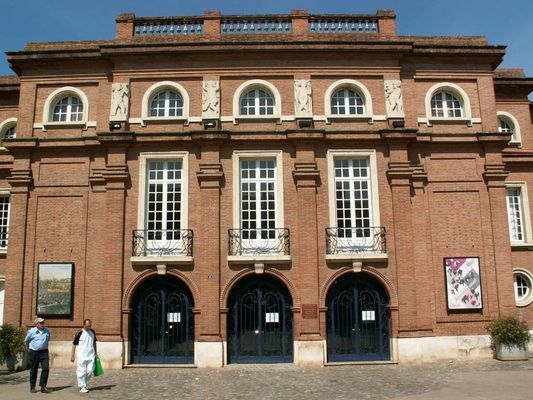 Thanks to the subsidies paid by the City of Paris to rebuild Montauban after the terrible floods of March 1930, a new facade was built, opening on the place Lefranc de Pompignan built in the late nineteenth century . The architects Jannin and Olivier composed a monumental entrance showing the elements of the Place Nationale (brick, semicircular arches, pilasters with projections, mirandes) and enhanced by four bas-reliefs by the sculptor André Abbal: La Musique, La Danse, La Comédie and Poetry.